As many of you will have come to realize, 2015 appears to become the year of special issues on ownership. The topic is bound to leave a mark on or even enter the research agenda of many additional scholars in the near future. This is exciting and we hope to bring many of them together on this blog. The future of blog contributions looks bright. I am pleased to foreshadow a couple of upcoming posts. We are excited to announce that the proofs for our special section on Ownership in the Journal of Behavioral and Experimental Economics have already been sent to the authors. A sneak preview is soon to follow. The special issue on Psychological Ownership in Marketing in the Journal of Marketing Theory and Practice is even one step further. It is out now and digitally available. Marko Sarstedt, one of the key figures behind this special issue, has kindly agreed to share his take on the insights the special issue provides us with. Marko has been known to many due to his intense engagement with partial least square analyses. He is not new to the ownership community either. His interest in psychological ownership has created a discussion platform that I fondly remember. Last year he, together with Colleen Kirk, organized a special session on the topic at the 2014 Academy of Marketing Science (AMS). Colleen, too, has kindly agreed to join us as a guest blogger and to share some thoughts that her intense engagement with psychological ownership has inspired. We are very excited to have her. She is the only person who has managed to contribute to both special issues. Given that the deadlines were not too far apart this really is a noteworthy feat. So stay posted and of course post yourself or let us know if there is anything you want to share about ownership. And as always, if you haven’t yet become a “face of ownership” but would like to, simply drop us a line with your photo attached. We wish you all a Merry Christmas & a Happy New Year 2015! 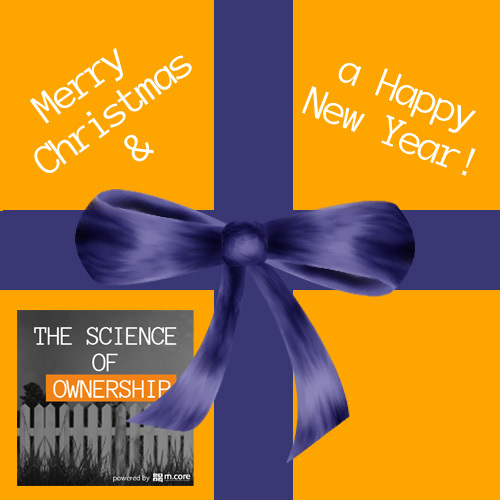 The Science of Ownership has been up and running for about two months now and we are very happy to have already sparked the interest of so many great people out there, who are either working on the topic of ownership themselves or simply want to know more about it. In this sense, we say thank you and look forward to an amazing year 2015, with many more Faces, Features, Contents, Call for Papers, Publications and Postings. It is going to be OUR year.